The All Hallows quilt block is the perfect choice for Halloween and so naturally, I used the obvious colour scheme for this nine patch block. And .. I'm always a sucker for a pinwheel block. 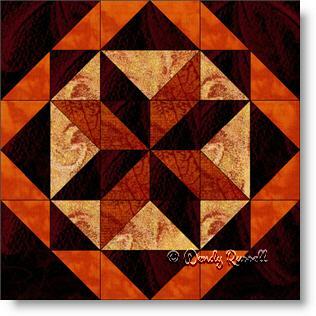 The quilt block features lots of half square triangles and flying geese units -- the first two patches that you learn as a beginner quilter. Depending on how you lay out the completed blocks, you might see secondary patterns emerging when you place the blocks side by side or separate them with sashing.